be still, your pounding hearts. we gather today to—wait, to consider the death that abounds in vases all over my house. the bouquet that’s gone bust. the flowers duly expired. the blooms well past their best-if-used-by prime. fitting we should consider the limp, the faded, the still–to my eye—beautiful here in the desperate days of end-stage winter. where if things don’t lighten up, warm up, spring forth, or d.) any of the above, we shall make like the flowers and go limp, fade, flop over, or d.) skip the above bit about beauty beheld. as we limp, no we stagger, toward spring, where week-ahead forecasts for 50s and 60s (remember, chair headquarters is here in chicago, along the shivering shores of lake michigan) tempt us to roll up the scarves, shove away mittens, we are exhaling the last final puffs of spent, dry, stale air from the pits of our lungs. we are clinging to walls, waiting for updrafts from parts of the world where, by now, it is blooming, it’s warm. we have, if you’re like me, tossed away sum after sum in the grocery store line, week after week plucking those plastic-sheathed posies, thinking a rose in a see-through sleeve is a beautiful thing, is the only thing really that might keep your spring hopes alive. i’ve done tulips by the near truckload. opted for a few precious clumps of wordsworth’s golden host, the daff-o-dill. clutched white roses at christmas. antique porcelain, with a mere wisp of mauve, up above. the hydrangea beside it spoke to me, too; i couldn’t leave the grocery without it. quite aware of the fact that i’ve shot my winter’s allowance for flowers, i am now milking my petals for all that they’re worth. thus, the tea rose up above, the hydrangea beside it, they’ve been in serious need of resuscitation—or recycling bin—for the better part of a week. but i’m not budging. i have, not yet anyway, no intention of tossing. long partial to the weak and infirm, i have every intention of milking every last drop of my fading bouquets. besides, i rather like the more challenging task of searching for beauty where others see none. in a world that rewards in-your-face, pop-up aesthetics, anna nicole’s bosom versus katie hepburn’s upsweep, i’ll take the upsweep. any day. and, yes, looking in the mirror is a daily reminder that to fade, honestly, naturally, without shame, is an ennobling possibility. so i will keep my bouquets parched as they are, gasping for that last breath of life. i will watch the sunset of their petals, as they fade into the horizon. i will honor them, keep them, well after death us do part. in the share-a-quirky-secret society, anyone else hold onto floral abundance ’til it’s turned into floral decay? beyond the dead buds, anyone else see the beauty in things old and faded and dry? wabi sabi does…. 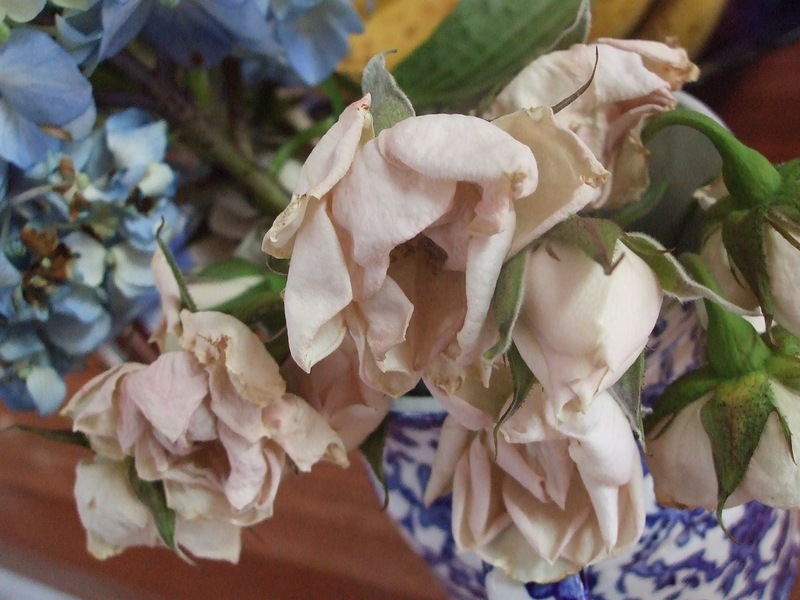 I used to keep them, dead bouquets, not out of honor but on account of laziness, a corner-of-the-eye acknowledgment that, oh, there’s a dead bouquet, maybe I’ll get to it…after the ironing perhaps…? Anyway that was before. Now I keep them to resuscitate into homemade paper. Old withered petals do beautiful things in a bin of paper pulp, drawn up to dry on a screen. Rose petals–dark ones–especially surprise: they bleed a little, spreading their gorgeous hues out beyond the bounds of their original shape, leaving a permanent water-colory mark. Talk about extending the beauty. They have extra to give out even after their utter end. MH, it’s probably too far for you to come to our paper making class from NJ, but let me recommend Arnold Grummer. He’s this awesome older gentleman who is the last, and probably also the first word in making paper. His website will set you up with everything you need. Buy a starter kit from him, watch his video, and away you go. Those of you within range of Chicago, well, come on down to our basement studio on Wednesday nights. Bring junk paper and old dead flower heads, weeds, bark, most things work, and watch the magic.